There was once a pizza delivery boy called Pizzo, whose job it was to take dinner to customers’ homes so they could eat and relax. The pizzas were put into a case, and he would put them in a box that was behind his seat on the moped. But Pizzo usually left the pizza box unlocked, because that way he could make his deliveries faster. 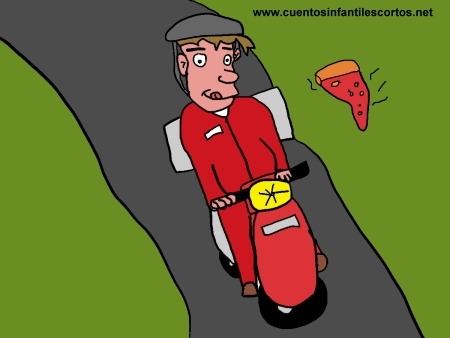 One day, as he was motoring around from home to home as usual, two cars suddenly appeared and stole the pizzas. Pizzo secretly followed them, and saw them pretend to be pizza delivery men at the next customer’s house. The poor customer opened the door to the thieves, who forced their way in and tied all the members of the house to a chair. The thieves were alarmed by this and began to file out of the door with their hands in the air and their eyes closed. As soon as they were outside, Pizzo tied them to a lamppost. By the time the police had arrived, Pizzo had got all the thieves under control, got his pizzas back, and the grateful family had invited him to stay for dinner. That day Pizzo ate for free, but he realised that you should always lock the pizza box so that no one will be able to rob you.